In a meeting Tuesday in Toronto, NASA Administrator Charles Bolden and K. Radhakrishnan, chairman of the Indian Space Research Organisation (ISRO), signed two documents to launch a NASA-ISRO satellite mission to observe Earth and establish a pathway for future joint missions to explore Mars. 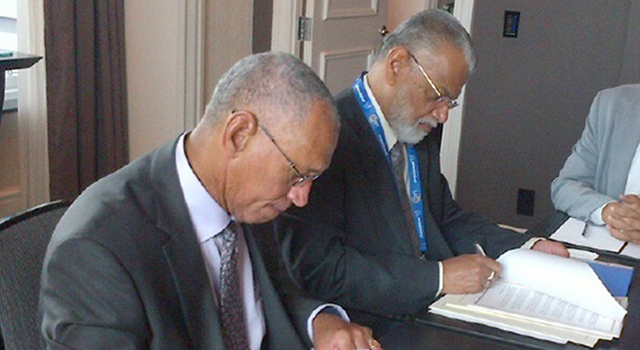 While attending the International Astronautical Congress, the two space agency leaders met to discuss and sign a charter that establishes a NASA-ISRO Mars Working Group to investigate enhanced cooperation between the two countries in Mars exploration. They also signed an international agreement that defines how the two agencies will work together on the NASA-ISRO Synthetic Aperture Radar (NISAR) mission, targeted to launch in 2020. 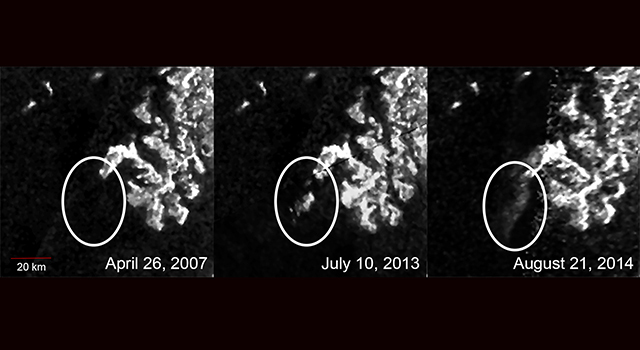 NASA's contribution to NISAR is being managed and implemented by the agency's Jet Propulsion Laboratory in Pasadena, California. The joint Mars Working Group will seek to identify and implement scientific, programmatic and technological goals that NASA and ISRO have in common regarding Mars exploration. The group will meet once a year to plan cooperative activities, including potential NASA-ISRO cooperation on future missions to Mars. Both agencies have newly arrived spacecraft in Mars orbit. NASA's Mars Atmosphere and Volatile EvolutioN (MAVEN) spacecraft arrived at Mars Sept. 21. MAVEN is the first spacecraft dedicated to exploring the tenuous upper atmosphere of Mars. ISRO's Mars Orbiter Mission (MOM), India's first spacecraft launched to Mars, arrived Sept. 23 to study the Martian surface and atmosphere and demonstrate technologies needed for interplanetary missions. "NASA and Indian scientists have a long history of collaboration in space science," said John Grunsfeld, NASA associate administrator for science. "These new agreements between NASA and ISRO in Earth science and Mars exploration will significantly strengthen our ties and the science that we will be able to produce as a result." The joint NISAR Earth-observing mission will make global measurements of the causes and consequences of land surface changes. Potential areas of research include ecosystem disturbances, ice sheet collapse and natural hazards. The NISAR mission is optimized to measure subtle changes of Earth's surface associated with motions of the crust and ice surfaces. NISAR will improve our understanding of key impacts of climate change and advance our knowledge of natural hazards. NISAR will be the first satellite mission to use two different radar frequencies (L-band and S-band) to measure changes in our planet's surface less than a centimeter across. This allows the mission to observe a wide range of changes, from the flow rates of glaciers and ice sheets to the dynamics of earthquakes and volcanoes. 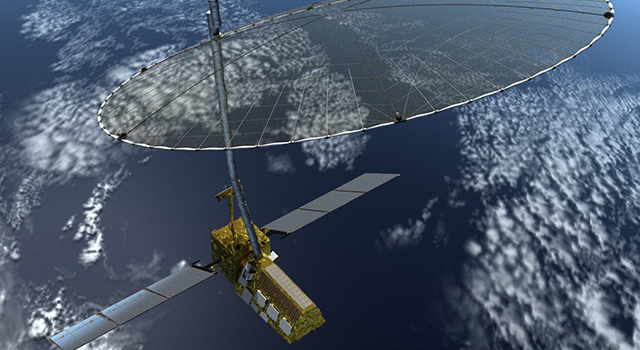 Under the terms of the new agreement, NASA will provide the mission's L-band synthetic aperture radar (SAR), a high-rate communication subsystem for science data, GPS receivers, a solid state recorder, and a payload data subsystem. ISRO will provide the spacecraft bus, an S-band SAR, and the launch vehicle and associated launch services. NASA had been studying concepts for a SAR mission in response to the National Academy of Science's decadal survey of the agency's Earth science program in 2007. The agency developed a partnership with ISRO that led to this joint mission. The partnership with India has been key to enabling many of the mission's science objectives. NASA and ISRO have been cooperating under the terms of a framework agreement signed in 2008. This cooperation includes a variety of activities in space sciences such as two NASA payloads -- the Mini-Synthetic Aperture Radar (Mini-SAR) and the Moon Mineralogy Mapper -- on ISRO's Chandrayaan-1 mission to the moon in 2008. During the operational phase of this mission, the Mini-SAR instrument detected ice deposits near the moon's northern pole. JPL has participated in providing navigation and communication support for ISRO's MOM. JPL provides navigation and Deep Space Network support for MAVEN, as well as Electra telecommunications relay hardware and operations. 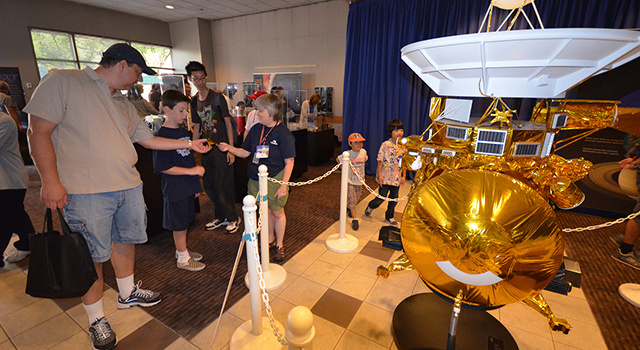 JPL, a division of the California Institute of Technology in Pasadena, manages the Mars Exploration Program for NASA.